Two men from the George Street area are being treated at the Karl Heusner Memorial Hospital (KHMH) after being shot multiple times by a man reportedly from the Supal Street Gang at about 11:30 Tuesday night at the corner of West Canal and King Street. The two injured men are Tarique Tzul, 25, of West Street, and Andrew Tate, 27, of George Street. Tate was shot twice in his right arm, once in the left arm, once in the left side of the abdomen, once below the stomach, once in the right upper leg, and once in the left upper leg. He has been declared to be in a critical condition and is in the Intensive Care Unit of the KHMH. Tzul was shot in his left upper leg and has been declared to be in a stable condition. Police announced that fifteen 9mm expended shells were retrieved from the scene of the shooting. Police say that at about 11:30 Tuesday night they responded to a report of a shooting at the corner of West Canal and King Street, where Andrew Tate and Tarique Tzul had been socializing. According to police, the two men reported that they were sitting on the step of a house in a yard when a lone gunman came up King Street, from the direction of George Street. As the man reached the corner of West Canal and King Street, however, he took out a gun and opened fire at Tate and Tzul, hitting them multiple times before escaping, the men said. Neighbors who were alarmed by the vicious gunfire quickly called police, and the two injured men were rushed to the KHMH. Police searched the area, but could not find the gunman. A quick investigation, however, led to the arrest of a man from the Supal Street area, a reputed gang member of the Supal Street Gang. Police say he will be charged with two counts of attempted murder, grievous harm, use of deadly means, and discharging a firearm in public. Apparently in retaliation for the attack on the men who are reportedly George Street Gang members, a young man from Supal Street was murdered yesterday in a yard on Plues Street when he went to a house that he frequently visits. 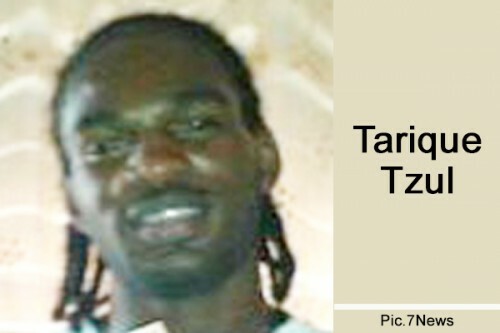 Tarique Cadle, 25, was shot in the head and leg by an unknown gunman. It is suspected, however, that the George Street Gang sanctioned the hit on Cadle because he is from Supal Street, and is said to be a relative of the man who is accused of shooting Tzul and Tate.